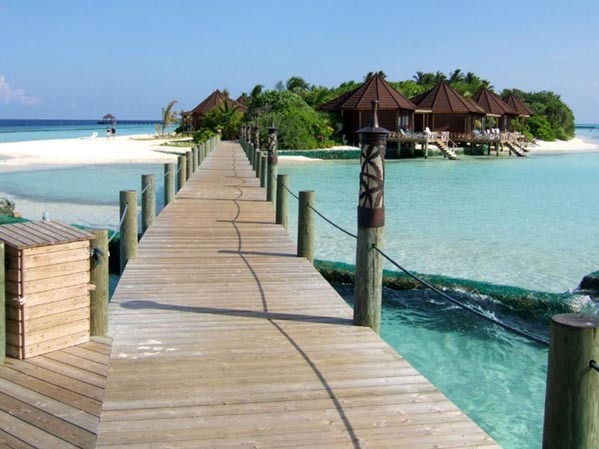 A small, idyllic island with lovely beaches, great snorkelling and beautiful coral gardens. Komandoo is a resort for adults, no children under the age of 18 are allowed on the island. 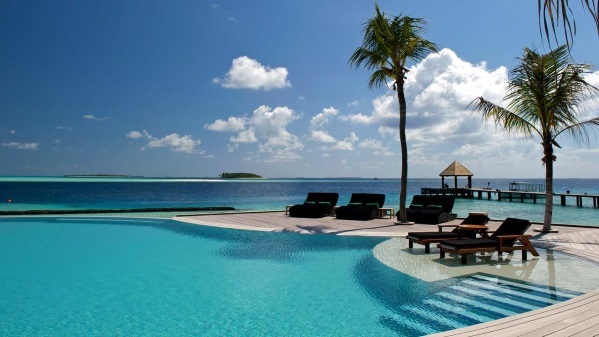 It is a peaceful island with a very laid back ambience and natural Maldivian character. The food is excellent and staff are exceptionally friendly and helpful. A popular island with our clients, many of whom return year after year for this impressive package at a reasonable price. 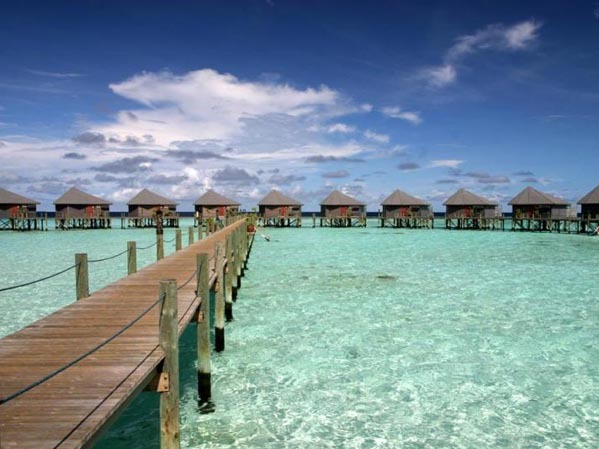 Komandoo is a small island measuring just 500 meters long and 100 meters wide, with a total of 69 room (14 of which are Water Villas). It boasts a beautiful turquoise lagoon, a magnificent house reef with superb snorkelling and idyllic white sand banks at each end of the island. The vegetation on the island is tropical with a beautiful 40-year old coconut plantation being the highlight. 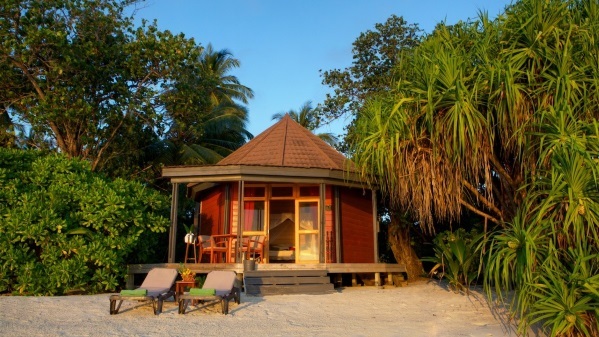 The Public areas are all built in picturesque Maldivian style, with thatched roofs and exquisite furniture. Komandoo is perfectly situated in a channel opening, which makes it very interesting for divers and snorkelers. 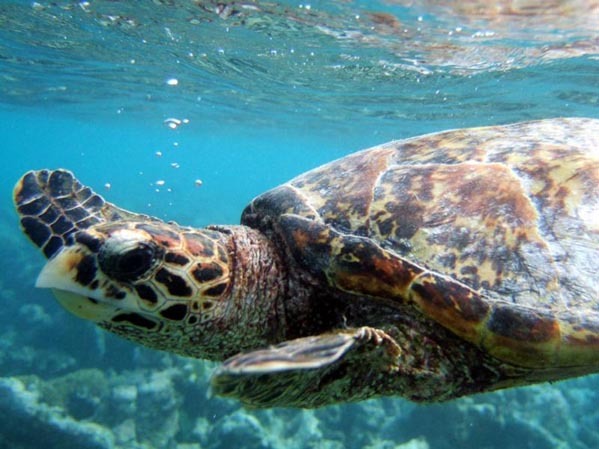 Expect to see Turtles, Mantas, Sharks and Rays. Sitting on the “Kandu Bar” terrace, it is often possible to see a school of dolphins playing as they pass by. 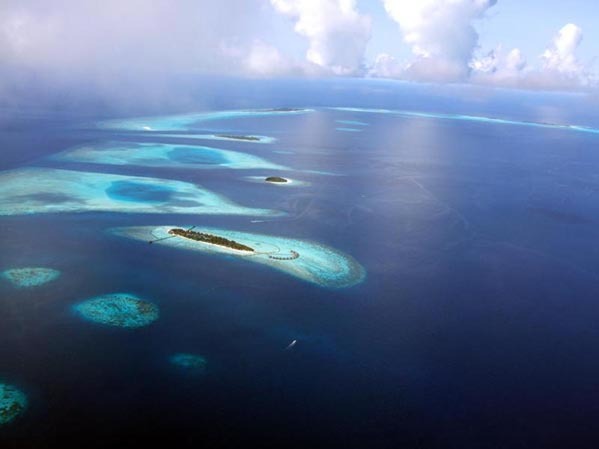 The reef is easily accessible from the beach and has some of the finest coral gardens we have seen in the Maldives. 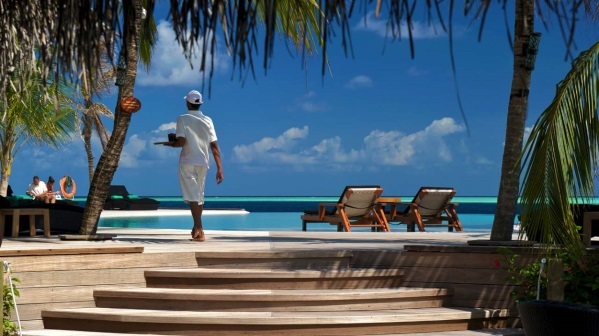 Accommodation is all detached, with the beach villas dotted around the beach perimeter and the cluster of water villas in the turquoise lagoon accessed by a decked walkway off one end of the island. Villas are built of wood and have a natural, stylish décor with modern amenities. 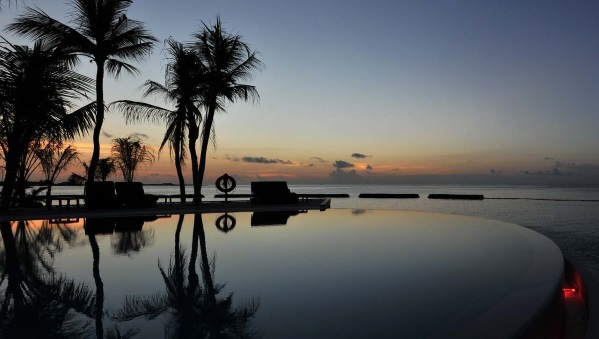 Our particular favourite is the Jacuzzi Beach Villa which has a wonderful open private garden with jacuzzi tub. 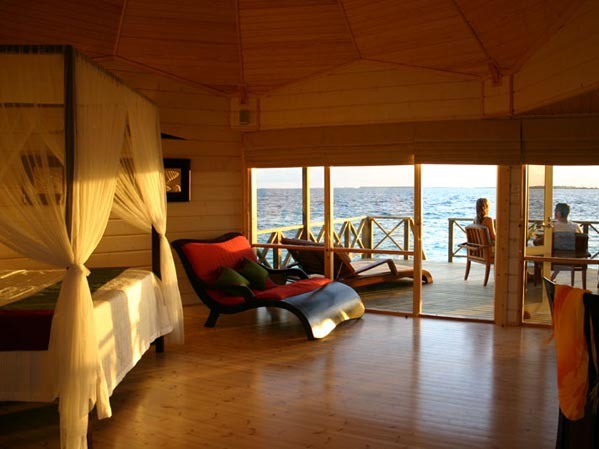 All villas have a comfortable wooden deck area with furniture to relax and admire views of the Indian Ocean. Being an adults only island, this is an ideal choice of resort for couples looking to relax in privacy or for Honeymoon couples. Note: All Room Types Can Accommodate One Extra Bed. 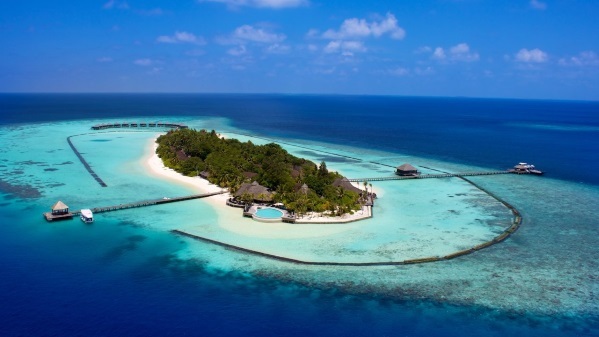 House Reef: is excellent, surrounds around 50% of the island and is easily accessible from the beach or the jetty. The house reef has four exit and entry points and the two jetties on either side of the island lead you right over the reef edge. 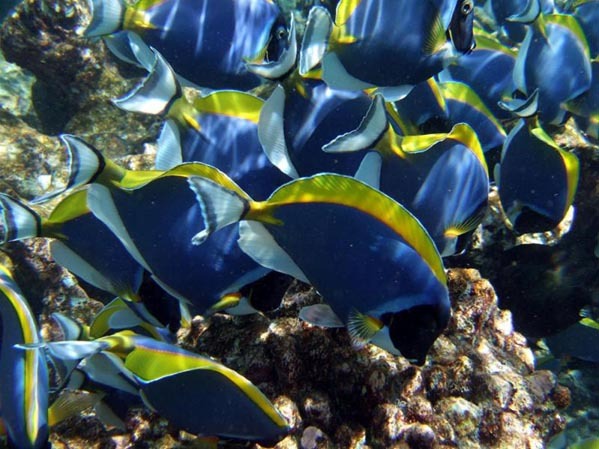 The range of fish is large and the extent of the coral gardens is particularly impressive. For those new to snorkelling, the very friendly Ocean Pro dive centre offer an introduction to snorkelling. Diving: Ocean Pro run the excellent dive centre, headed by Rosa Brau whom we found to be extremely friendly and helpful. Komandoo ProDivers is a PADI 5-Star Dive Center offering modern equipment, excellent facilities and a variety of dive courses. There is no additional cost for Nitrox diving. More than 40 dive sites are located in the area around Komandoo. All dive sites are within reach in 10 to 45 minutes by boat. Boat trips are available everyday of the week – mornings and afternoons. 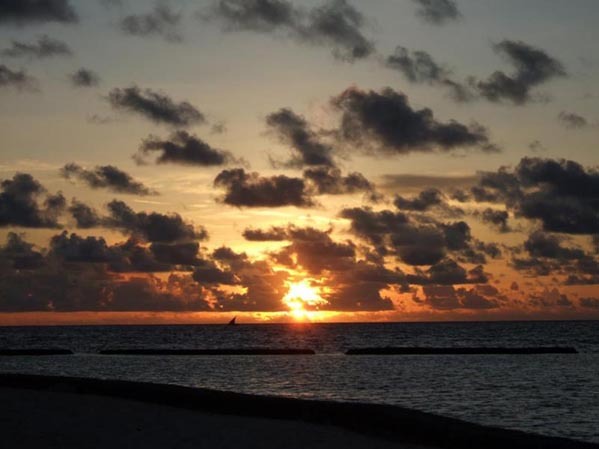 Full day, early morning, and night dive excursions are organised regularly. Independent day and night diving is also available at the house reef. Other courses are conducted on a request basis. For specialised courses it is advisable to send in your requests before your arrival. Specialty courses like Shark Diver, Marine Protector, Equipment Specialist, Marine Biologist, Drift Diver, Night Diver, UW Photographer are available. Water Sports: canoes and windsurfing boards are available on a complimentary basis to all guests. Free of charge: Windsurfing, Canoeing, Table tennis, darts, beach volleyball and badminton are available. For those who prefer a more leisurely pace, a selection of board games and books can be enjoyed at the bar. Evening Entertainment: Low key local entertainment is provided on selected evenings.